DIE Veneris, 7 die Februarii. Message from H. C. with Bills. Message to H. C. with Bills. Attainted Persons brought to the Bar. Attainted Persons to be carried back to The Tower. Epus. Cov. et Lichfeild. Dux Cumberland. 1. "An Act for the better regulating of the Manufacture of Broad Woollen Cloth, within the West Ryding of the County of Yorke." 2. "An Act against Importing of Foreign Woolcards, Card-wire, or Iron-wire." 3. "An Act for confirming of Three Acts, therein mentioned." To deliver to them the Bill for restoring Charles Earl of Derby to the Manors of Hope and Hopesdale, Mould and Mouldsdale, in the County of Flint; and desire Concurrence therein. 2. 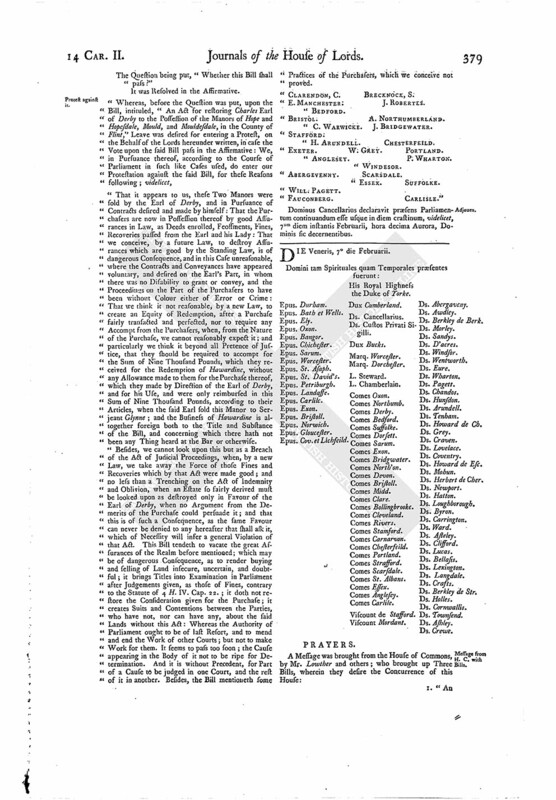 To return them the Bill concerning the Office of registering Pawns and Sales of Goods in London and Westm. and to desire Concurrence in the Alterations made by this House. The First was Augustine Garland; who, having kneeled at the Bar until he was bid to stand up, the Lord Chancellor told him, "That he being a Person attainted for High Treason; but, by reason of an Act of Parliament, Execution being to be stayed until His Majesty and both Houses of Parliament by Act shall give further Order; and there being now a Bill brought from the House of Commons for the Execution of him and the other Persons who are in the like Condition with him; the Lords desire to hear what he can say for himself, why the said Bill should not be passed for his Execution:"
To which the said Augustine Garland said, "That he had nothing to say; but referred himself to the Mercy of the King and this House; and humbly craved the Benefit of His Majesty's Proclamation, upon which he came in, and rendered himself to the Serjeant at Arms attending the House of Commons." And he pleaded, "That he was under Force at that Time, by reason of Soldiers, and compelled to do what he did; but as soon as His Majesty's Gracious Proclamation came forth, he accepted of it, and rendered himself within the Time prescribed." And he said, "That Honourable House of Commons, that he did heretofore so idolize, had given him up to Death; and now this Honourable House of Peers, which he had so much opposed, especially in their Power of Judicature, is now made the Sanctuary for to fly to for his Life. He submitted himself to His Majesty's Gracious Proclamation; which he took Hold of, and rendered himself, and hopes to receive Mercy by it; and now submits himself to His Majesty and this House for Mercy." Who made a long Speech. 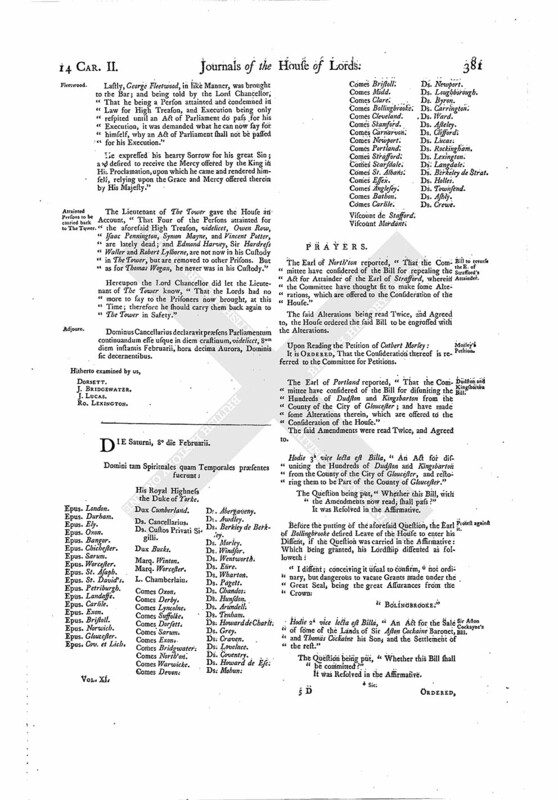 The Effect of it was, "That the House of Commons did make some previous Vote, that but Seven Persons should be excepted out of the Act of Oblivion for the Murder of the late King, of which Number of Seven he was none: A little while after, the King's Proclamation coming, he took Hold of it, and came and rendered himself; looking upon the King's Promise therein, being with the Advice of both Houses of Parliament, as the great Mercy and Security offered by His Majesty; and this was when he had Thoughts within himself how to contrive his Escape, out of this his Native Country, beyond the Seas: And he is come to acknowledge his Sorrow for his great Crime, and to take his Life from the King merely upon Mercy." He said, "He had nothing to justify, but did condemn himself, and abhorred the Fact; and, taking Notice of His Majesty's Gracious Proclamation of Mercy, he came in, and rendered himself upon it; and craves the Benefit of it for his Life." And being asked the like Question as others before him; he submitted himself to the Mercy of the King and this House, and craved the Benefit of the King's Proclamation of Mercy, upon which he came in and took Hold of it, and desires now the Mercy of it for his Life. And the same Question being asked of him; he pleaded the Benefit of the King's Proclamation, upon which he came within the Time. And being demanded what he could say why the Act for Execution of him should not pass; he confessed his hearty Sorrow for his Sin; and desired the Mercy of the King's Proclamation, upon the Confidence of which he came and rendered himself. And pleaded for Mercy upon the Proclamation of the King. And further delivered in a Paper of what he had further to say on his Behalf; which he desired it might be taken into Consideration by their Lordships. And the Lord Chancellor told him, "He was brought hither to be heard what he could say, why an Act of Parliament should not pass for his Execution; he being a Person dead in Law, and condemned, for that Treason of murdering the late King." He made a long Narrative, but the Effect of it was; he pleaded, "That he was innocent from the contriving of the Murder of the King; and did oppose it in the High Court of Justice what he could, for which he was threatened to be ruined and undone. As concerning the Signing of the Warrant for Execution of the King, it was done after the Death of the King, and was forced to do it; expressing his hearty Sorrow for the same, and submitted himself wholly to the Mercy of the King and this Honourable House." Lastly, George Fleetwood, in like Manner, was brought to the Bar; and being told by the Lord Chancellor, That he being a Person attainted and condemned in Law for High Treason, and Execution being only respited until an Act of Parliament do pass for his Execution, it was demanded what he can now say for himself, why an Act of Parliament shall not be passed for his Execution." He expressed his hearty Sorrow for his great Sin; and desired to receive the Mercy offered by the King in His Proclamation, upon which he came and rendered himself, relying upon the Grace and Mercy offered therein by His Majesty." 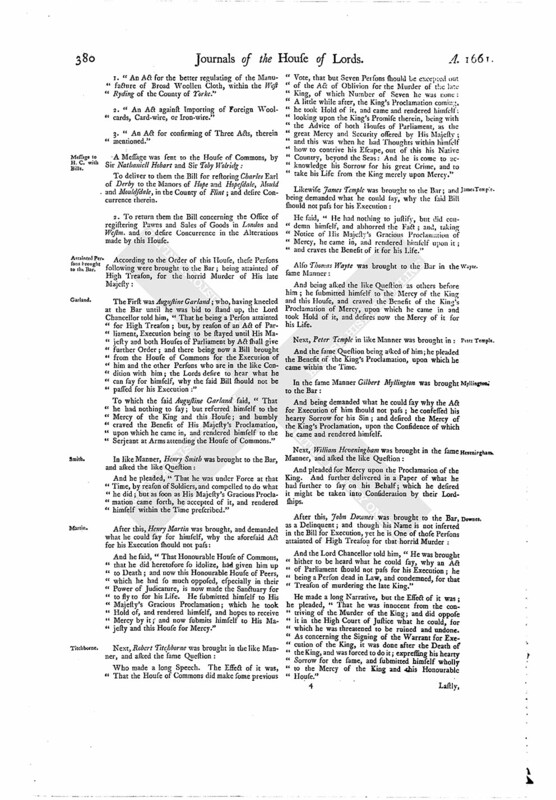 The Lieutenant of The Tower gave the House an Account, "That Four of the Persons attainted for the aforesaid High Treason, videlicet, Owen Row, Isaac Pennington, Symon Mayne, and Vincent Potter, are lately dead; and Edmond Harvey, Sir Hardress Waller and Robert Lylborne, are not now in his Custody in The Tower, but are removed to other Prisons. But as for Thomas Wogan, he never was in his Custody." Hereupon the Lord Chancellor did let the Lieutenant of The Tower know, "That the Lords had no more to say to the Prisoners now brought, at this Time; therefore he should carry them back again to The Tower in Safety." Dominus Cancellarius declaravit præsens Parliamentum continuandum esse usque in diem crastinum, videlicet, 8um diem instantis Februarii, hora decima Aurora, Dominis sic decernentibus.